Ahh the new year! The time when the gyms are packed, cigarettes meet the trash can and everyone and their mother is on a diet. As new resolutions are spoken and broken to begin 2015, we’re entering critical time in the mobile business world. This new year, more than any before, ushers in a truly mobile-first era. All too often, we see long-standing brands and businesses become casualties of this mobile shift, yet enterprises can get ahead of the curve. By adopting these 5 mobile resolutions in new year, businesses can set themselves up for sustained success with their mobile apps in 2015 and beyond. Apps are not supposed to be a simple extension of the website. To set themselves apart, brands need to use their apps to either fill a need for their consumer or creative an addictive experience for the user, preferably both. Customer experience is the top priority of businesses’ marketing budgets, and the priorities of your app strategy should be much the same. Right now, mobile search resembles the early days of the Internet. Remember the fifty different browsers to choose from, like Netscape, AskJeeves and Dogpile? It’s much the same, complete with the crazy names. Deep-linking is one of the core strategies that many are using to establish the mobile search solution, so ensure that your app content is optimized, because this chaotic world of app search won’t last the year. While the iOS vs. Android debate still rages as strong as ever, all the holiday numbers indicated a huge win for Apple this year. Over 51% of all mobile activations this past Christmas were Apple products, with the Android totals split between multiple vendors. By all means, build an iOS version of your app as well as Android. In the MobileSmith platform, creating both – at the same time – is a breeze. While the wearables market is clearly on an upward trend, the smartphone is still far and away the dominant technology. 2015 is likely to see a large increase in wearables as companions to smartphones as opposed to standalone mobile devices. These wearable devices may well be the future, but smartphones and tablets are still the beating heart of our mobile economy. After the Internet changed commerce in a way that was never seen before, mobile is doing the same thing not 20 years later. 37% of mobile users in the US preferred shopping on a mobile device than in a store, during the recent holiday season, and with innovations like Apple Wallet and digital currency, we are rapidly moving towards a primarily mobile economy. 2015 will likely see a huge spike in mobile commerce. Does Your Business Strategy Include Mobile Apps in 2015? The mobile revolution has created an incredibly dynamic business environment; one where it’s very easy to find yourself very suddenly two steps behind the curve. Many a business giant has met their downfall, simply by not paying attention to the change occurring around them. 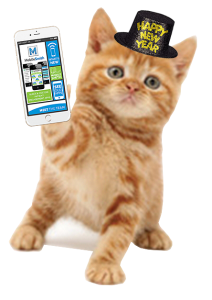 This new year, you can help your business by using these resolutions to embrace the new mobile culture that has taken hold, and MobileSmith can help you on the path of mobile success. With our cutting-edge, easy-to-use app platform and app strategy consulting, we’re here to help you create a fantastic mobile app experience for your users. It’s going to be a great year! Request a FREE mobile strategy session today!